Rob: And hello, I’m Rob. Hey, Feifei. Feifei: The match? No, Rob. I had better things to do! Rob: Oh, you should have done. 3-0! It was a giant-killing! 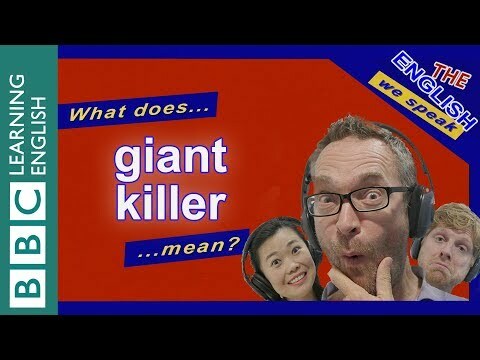 wants to see giants being killed? there were no real giants. I mention the score was 3-0? team is beaten by a less strong opponent. The winners are called ‘giant killers’. So a giant-killing is quite an achievement? it’s great when it happens. surprise because you’re so used to losing! a football fan, you’ll never understand. a bit like a giant killing. by getting more lines to stay in the script. Rob: Errr, I don’t think so, Feifei. You always have more to say. Rob: OK, if you say so. See you later. Feifei: Ha! 1-0 to me. Bye.